Okay! Musume Time: The Princess Will Have Her Coronation! Michishige Saho to Become A Regular Member of HouPri! The Princess Will Have Her Coronation! Michishige Saho to Become A Regular Member of HouPri! ... This is a lot later than it should be! 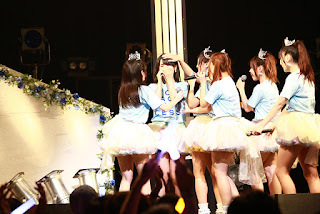 On the 9th of August during the Houkago Princess 4th Anniversary Live and their Major Debut Commemorative performance, it was announced that Michishige Saho of the Cadets would finally be awarded her desired promotion to that of a Regular member! The announcement had been made during the groups encore, which had been going normally until suddenly, The Imperial March (the theme song for Darth Vadar) began playing, only to send the members of HouPri into a panic at the sound of the unexpected tune. An envelope was then passed to Student Council President, Odagiri Nana, who made the surprising announcement and happy news that the Japanese History Chairman, Michishige Saho, would finally become a Regular member after almost two years since she had joined! 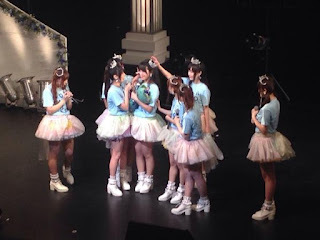 It was also announced that Saho will hold her Coronation on August 20th, making her promotion official and crowning her as a Princess withing Houkago Princess and leaving her days as a Cadet behind. Okay, firstly, I am so freakin' HAPPY that Sahochi is finally getting her chance to become a Regular member of the HouPri lineup. Ever since she joined, I have waited for this day. Ever since both Maika and Himari joined, and even after both of them were promoted at a quicker rate than Sahochi, I have hoped and prayed for the day that Sahochi would become a full member of the group, that she would be able to dance in the front with everyone and be given duet lines or more. As nearly two years have passed since Sahochi joined HouPri, I wished for her to become a Regular member, only to find out she was still a Cadet whenever it seemed like it would be announced that she could be promoted. For a long time, I've felt disappointed that Sahochi was never given this chance, and even now after it's announced, I feel like this could have been done so much sooner, because she has always been a wonderful, dedicated member. Hearing this news made me cry - as any happy news with HouPri does, really - and I was overwhelmed and thankful, because this is what many fans have been waiting for. It bothered me a lot, knowing that Sahochi was the first of the 6th generation to be added, and the last of them to actually get promoted, especially when Maika was promoted a lot more quickly than the average Cadet or Apprentice. I know, Maika deserves it, cause Maika is fantastic, but on so many occasions Sahochi showed her dedication to HouPri... I mean, the one big break she took was to finish her University exams, and that was the only time I can recall. Other members had breaks to just focus on school, but Sahochi? She studied, and went to performances. She worked hard, so for me, I feel that she does indeed deserve the Regular member title; she just deserved it way earlier than this. Huh, you know? Now I get why fans of the H!P Kneshuusei get pissed off with some girls waiting to debut for so long. I really get it! Okay, so I'm whinging a bit. I'll quiet that down... for now. Sahochi is wonderful, and she has truly grown since joining Houkago Princess back in 2013, and I am glad that she's stuck around this long and finally become the Regular member she so desired to be. Even though she watched her fellow 6th generation members get promoted before her, even though she feels like she had many things she could not reach, I still think she is one of the greatest members of Houkago Princess. Now, I hope to see her blossom as a performer. I am happy for Sahochi, and she deserves to shine after so long! On her Coronation day, I hope that she gets her chance to show everyone what she is truly made of as a Regular member! 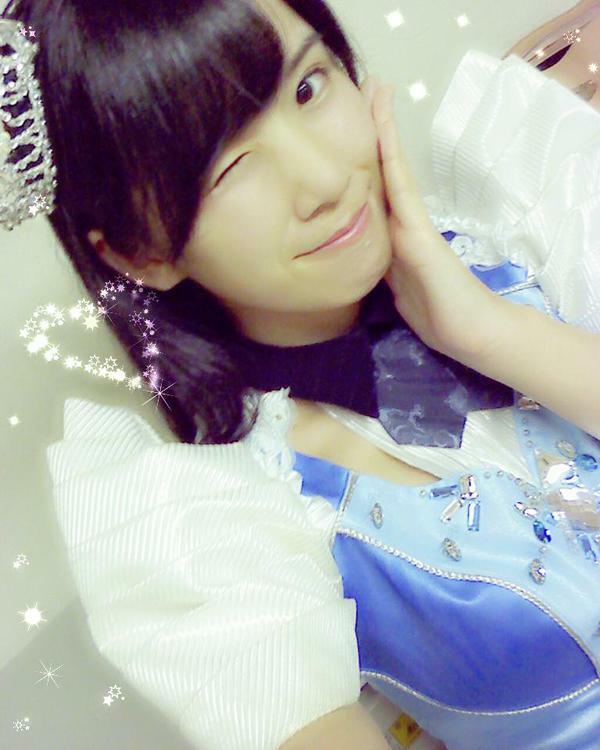 Michishige Saho of Houkago Princess, congratulations on your promotion and up-coming Coronation! May you steal the hearts of the fans, and show everyone just how great you are! Seifuku Cinderella, Houkago Princesses Major Debut mini-album, will be released this August 19th! Be sure to check out the MV, and potentially buy it, too!